In a March 26 breakfast meeting with Washington reporters, Homeland Security Secretary Janet Napolitano said Congress should not include border security metrics as a prerequisite or "trigger" in immigration reform legislation to grant legal status to about 11 million people living in the country illegally. "Relying on one thing as a so-called trigger is not the way to go", Napolitano said. "There needs to be certainty in the bill so that people know when they can legalize and then when a pathway to citizenship … would open up." Explaining why DHS had not fulfilled its long-standing promise to develop metrics for border security, she said, "That is a very — it turns out — a very difficult thing to do in any kind of statistically significant way." The administration's admitted stonewalling was the most direct evidence of its retreat from its previous pledges of commitment to rigorous standards of accountability at the border. Two years earlier, Secretary Napolitano had called for a new, more rigorous border security standard to replace the standard of "operational control", which had been in place since 2004. Napolitano disavowed "operational control", calling it "an archaic term". "The cost of defining success at the border is critical to how we move forward", she told the Senate Committee on Homeland Security and Governmental Affairs. "It must be based on reliable, validated numbers and processes. It must tell the complete and transparent statistical story." The new term, the secretary said, would provide "a more quantitative and qualitative way to reflect what actually is occurring at the border." Two years after Napolitano called for development of the new standard, it remains undelivered. DHS officials said in official correspondence and in congressional testimony that its due date was November 30 of this year. Just as the 2011 retreat from "operational control" had drawn criticism from congressional critics who said the metric was providing evidence of the Border Patrol's inability to control the border, the failure to deliver the new border index had also been criticized. Asked McCain, "And we're using them." Responded Fisher, "We're just starting to." Fisher provided this explanation of the purpose of the metrics: "We want to know how many people come across the border and of that number, how many people do we either apprehend or turn back?" McCain asked, "So have you developed the metrics and the standards or not?" "Well, it is in the final stages of development, senator. I can tell you that", Fisher replied. The significance of Fisher's disclosure was difficult to ascertain. The Border Patrol has long counted not only apprehensions and "turn backs" but also "got-aways" — people whose illegal entry into the United States was detected, but who escaped into the interior of the country. 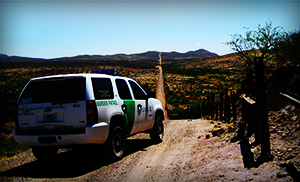 What follows is a chronological account of Border Patrol and DHS positions on border metrics. We are far better off now than we have ever been with respect to border security. I am confident that with our increased staffing, more tactical infrastructure, and integrated technology improvements, we have established a solid anchor for gaining, maintaining, and expanding operational control of our borders ... . We continuously assess our progress and how we can improve it. The GAO also reports: "DHS plans to improve the quality of border security measures by developing new measures with a more quantitative methodology. CBP is developing a new methodology and measures for border security, which CBP expects to be in place by fiscal year 2012." Stana also criticizes the Border Patrol's decision in late 2010 to measure its performance by reporting the number of apprehensions. He compares it to a baseball statistic that shows "just the number of hits" without the number of at-bats. He defends the Border Patrol's previous use of "operational control" as a border metric. "I didn't think miles under operational control is a bad measure," he says. "It wasn't perfect. But if you looked at how they developed it and, you know, some of the controls for reliability and data that they put into it, again, not perfect, but it was something that was easy to understand. You had a numerator, and you had a denominator." Stana discusses the practical meaning of Border Patrol metric's: "[T]he Border Patrol's definition of operational control does not require agents to apprehend each and every illegal entry. For example, although Yuma is classified as having 100 percent operational control, about 10 percent of the entries are classified as got-aways. These are people that were never apprehended." For the 1,120 miles not reported to be under operational control, the Border Patrol said it was likely to detect about — but not apprehend — in about two-thirds of the miles and in one-third of those miles does not have the capability consistently to detect at all. April 4, 2013 — The Los Angeles Times discloses that internal Customs and Border Protection records show that Border Patrol agents apprehended fewer than half of the illegal border crossers into a portion of the Arizona border with Mexico. The Times reports that between last October 1 and January 7 agents used a new system of airborne radar to detect 1,874 people in the borderlands west of Nogales. But an additional 1,962 people avoided arrest and disappeared into the United States after being spotted by the radar, the paper reports. April 5, 2013 — Reacting to the Los Angeles Times story, the chairman of the House Homeland Security Committee calls on the Obama administration to provide data to support its claims that the Southwest border is more secure than ever. 1 Transcript of Christian Science Monitor breakfast, March 26, 2013. See also "Napolitano: Border Security Trigger ‘Not The Way To Go' In Immigration Reform", Talking Points Memo, March 26, 2011. 2 Julia Preston, "Officials Concede Failures on Gauging Border Security", The New York Times, March 21, 2013. 3 Napolitano testimony at hearing of the Senate Committee on Homeland Security and Governmental Affairs, hearing on "Securing the Border: Progress at the Federal Level", May 4, 2011. 4 Hearing of the Senate Committee on Homeland Security and Governmental Affairs, April 10, 2013. 5 Remarks by Robert C. Bonner, Dedication of U.S, Border Patrol Academy, Artesia, N.M., October 21, 2004. 6 Statement of Robert C. Bonner to House Appropriations Committee, Subcommittee on Homeland Security, March 15, 2005. 7 Michael Marizco, "Patrol seeks border ‘operational control'", Arizona Daily Star, March 31, 2005. 8 Aguilar testimony to the House Armed Services Committee, hearing on the National Guard and Border Security, May 24, 2006. 9 Transcript of Chertoff news conference on the fiscal year 2006 enforcement numbers, October 30, 2006. 10 Author's notes from presentation by Jeffrey Passell at OECD Working Party on Migration, June 13-14, 2007. 11 Aguilar testimony to Subcommittee on Immigration, Refugees, and Border Security, hearing on "Securing the Borders and America's Points of Entry, What Remains to Be Done", May 20, 2009. 13 "Preliminary Observations on Border Control Measures for the Southwest Border", GAO-11-374T, February 15, 2011. 14 Napolitano testimony to the House Committee on Homeland Security, hearing on "Understanding the Homeland Threat Landscape — Considerations for the 112th Congress", February 9, 2011. 15 Stana testimony to House Committee on Homeland Security, Subcommittee on Border and Maritime Security, hearing on securing borders, February 15, 2011. 17 Rep. Smith's response to GAO Border Security Report: "44 Percent is a Failing Grade", February 17, 2011. 18 Rep. Cuellar at hearing on Border Security, House Committee on Homeland Security, Subcommittee on Border and Maritime Security, March 15, 2011. 19 "Border Patrol Strategy: Progress and Challenges in Implementation and Assessment Efforts", GAO-12-688T, May 8, 2012. 21 Rep. Cuellar at House Committee on Homeland Security, Subcommittee on Border and Maritime Security, on border security, February 26, 2013. 22 Sen. McCain at Senate Committee on Homeland Security and Governmental Affairs, hearing on border security, March 14, 2013. 23 Brian Bennett, "Radar Shows U.S. Border Security Gaps", the Los Angeles Times, April 3, 2013. 24 Brian Bennett, "Obama Administration Pressed for Border Data", the Los Angeles Times, April 5, 2013. 25 Miller press release, "Miller, McCaul, Cornyn Introduce Legislation to Secure America's Borders", April 9, 2013.